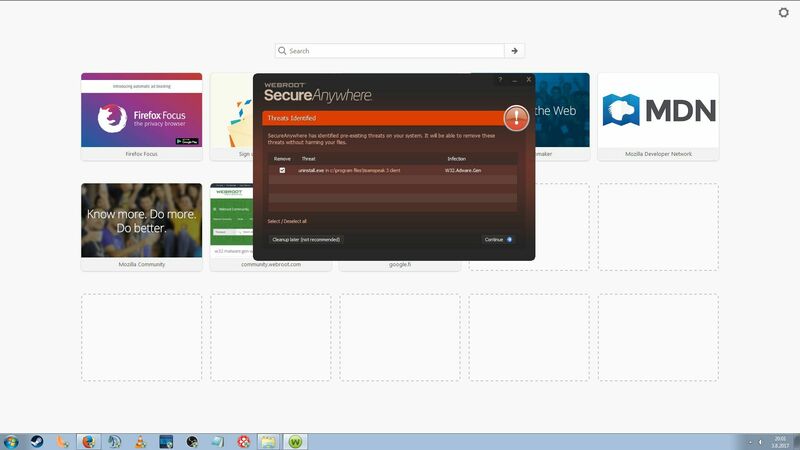 i was downloading a game i used to play and webroot said it was a virus. The game i was downoading is called dragonnest. is it cause i have pup checkbox checked? Please do not run the program until you have filed a Trouble Ticket and Support has answered. While False Positives do happen, this is not a PUP or PUA: the detection would be something like pup.gen This is flagged as malware and not a PUA. ty david i sent in a ticket. now how do i look at the ticket and the progression of it? I see the ticket, one second and I`ll check that file determination! OK I have fixed this determination, it was actually a false positive. 1. Open on the cog icon next to PC Security. 2. Click the Quarantine tab. 3. Click the check box next to the filename, then click Restore. Now that this change is in effect, we request that you run another scan of your computer (click "Scan My Computer" on the main overview window). If the same detection occurs, please let us know immediately. A "False Positive" or "F/P" is when a good, clean file gets detected as malicious by signature or heuristically detected as malicious by an anti-virus or anti-malware program. It means the file isn't really bad, but the anti-virus thinks it is. FP or False Positive is when WSA shows something as being malware that is actually safe. The file in question is actually safeand sshould not have produced a warning from WSA. At this point, if you try the same file again, WSA should ignore it, but it also would be safe for you to ignore a warning, but only for that one specific download/file that you reported. Refer to the directions above on removing it from the Quarantine, and let us know if it shows a problem again when yoy run it. I have been using Rejetto's tiny hfs http file server for years. It's a great little program. Today Webroot reported it as being in the W32.malware.gen group. The program is open source. You can get the source code and check it yourselves. I just downloaded this from www.rejetto.com and did not see any file detections. I did see the URL being blocked, and will have that investigated and corrected though - was that what you were seeing? If you did see files being detected please Submit A Support Ticket so that we can investigate what was detected. Yes, thanks so much, but I also began using it with stunnel to be able to encrypt and use SSL. Maybe you can check that program too, please because WRSA alerted me to the referenced malware and on a scan it said it detected it in three hfs http files that were in my computer. One the original download, and the other two updates done directly to Rejetto from within the program. I did submit all three files. So thanks again. Yes, they sure are. They're the best. so i can just skip the virus notice??? and run the setup? i have the same problem with the NexonLauncher for a game as well. same website as the previous user having this problem. by "false positives" i take it you mean its diagnosed as a virus but is safe?? If you believe that you have suffered a false positive detection then the best approach is to Open a Support Ticket to advise the Support, so that they can investigate the veracity of the report and if they agree they can then whitelist the file in question in the Webroot Cloud...et voila...no more problem. Maybe new thread since this one is marked [solved], but Webroot team is great. Follow their advice.